If you’re looking for a fun, whimsical, boho set then the Wildfox Fall 2014 collection is your cup of tea. Designer Kimberley Gordon made her NYFW debut at Pier 59 Studios. Inspired by Jane Austen, this assortment was not short on wittiness and romance…some of the cutest graphic T’s we’ve seen in a while are all included. Declare you’re ‘Mrs. Darcy’ with one of them. We’re sure Mr. wouldn’t mind one bit. Nikki Hilton was all about it too, catching her sitting frontside. The too-cute T’s are what stands out the most. ‘I Need A Drink,’ ‘ello,’ and the Union Jack are all adorably declared across the cotton cuties. 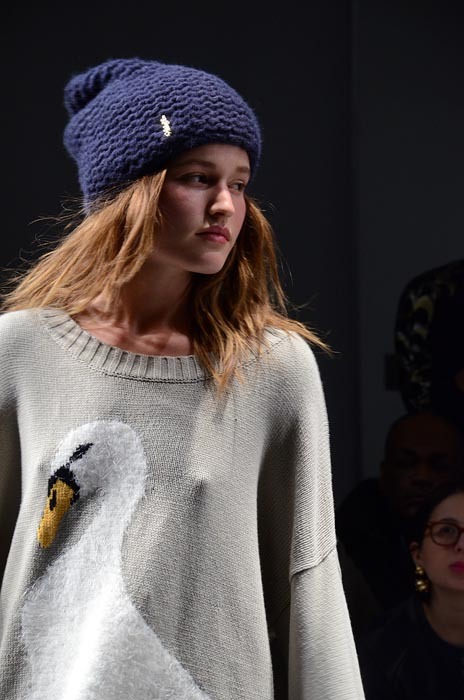 Graphic printed sweaters are just as dear, especially in an adorable swan design. Skirts are short and frilly and long and flowy. Cover up or show a little leg, your choice! Overalls are fun and retro and look presh with floral tops underneath. There’s also an abundance of slouchy beanies are gorgeous little floral hair details that add to the whimsy feel. Some of the same flowers are popping out of high laced boots…femininely playful! A dreamer’s delight. We enjoyed getting sucked into this fantasy. Free spirits, please! fdmLOVES WILDFOX Fall 2014 selects by Brigitte Segura, written by Allison Ripa.